Apple senior director of Siri, Alex Acero, is scheduled to appear at this year's AI Frontiers conference, where he will be joined by other experts in the field to discuss the role natural language processing plays in modern personal assistant technology. 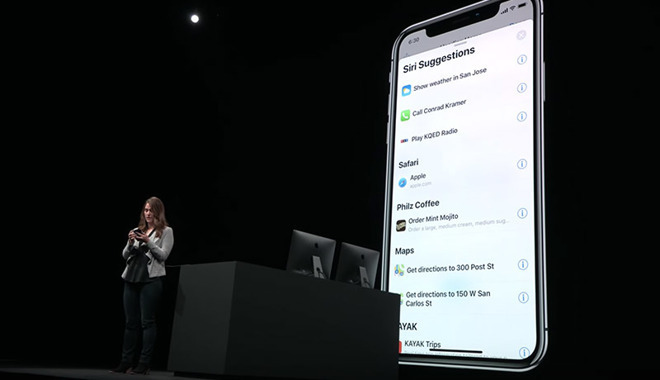 Apple product manager Kim Beverett demonstrates Siri Shortcuts onstage at WWDC 2018. According to the AI Frontiers website, Acero will take part in a panel entitled "Personal Assistants," which is slated to follow the conference's opening keynote address on Nov. 9. The Apple executive will likely discuss Siri, Apple's virtual assistant technology that powers user interaction on iPhone, iPad, Apple Watch, Mac and HomePod. Acero joined Apple in 2013 as part of the tech giant's efforts to build out Siri's speech recognition and machine learning capabilities. Before Apple, Acero served a 20 year stint at Microsoft Research, where he managed teams in speech, computer vision, NLP, machine translation, machine learning and information retrieval. AI Frontiers brings together a range of industry professionals working on artificial intelligence and deep learning applications. Over the course of three days, panelists will present and discuss their projects, whether it be scholarly research or products used by millions of people around the world. Joining Acero's panel are Amazon Alexa director Ruhi Sarikaya and Google research scientist Dilek Hakkani-Tur, both experts in the field of natural language processing. Amazon's Alexa is one of the most popular virtual assistants on the U.S. market thanks to the company's Echo speakers. With integrations, or skills, that tap into third-party products and services, Alexa enables voice control of smart home appliances, media playback devices and services, shopping, communications and more. Google's virtual assistant technology, aptly dubbed Google Assistant, is another top contender. Users and critics have found Assistant to be one of the more accurate voice-enabled products available, a testament to Google's heavy investment in AI and machine learning systems. At Google IO 2018, the company showcased a particularly impressive feature dubbed Google Duplex which, when trained correctly, allows Assistant to carry a limited conversation with a human. Acero is no stranger to the public eye. Last year, the Siri director provided an inside look at the technology's ability to learn new languages, specifically how data is ingested, processed and prepared for consumer use. Apple has consistently improved its virtual assistant since it saw release as part of iOS 5 in 2011. Other tech companies have followed with their own solutions, Amazon and Google being the most notable. Nearly seven years old, Siri's capabilities are still largely restricted to services tasks like creating calendar entries or controlling basic device functions. That is expected to change when iOS 12 launches this fall. The next-generation operating system includes a new Shortcuts app that will allow users to create and run app macros via a custom Siri phrase. For example, an iPhone user can create a shortcut called "Heading home" that commands Siri to query Maps for a navigation route, send a custom text via Messages, set a home thermostat and begin media playback.